Welcome to Bogues Shores! Newly updated living room, sleeping area and kitchen awaits you with all of the ammenities of home: queen size bed, pull out queen size couch to sleep 4 comfortably, fully stocked kitchenette with new built in microwave, new stove top and fridge. 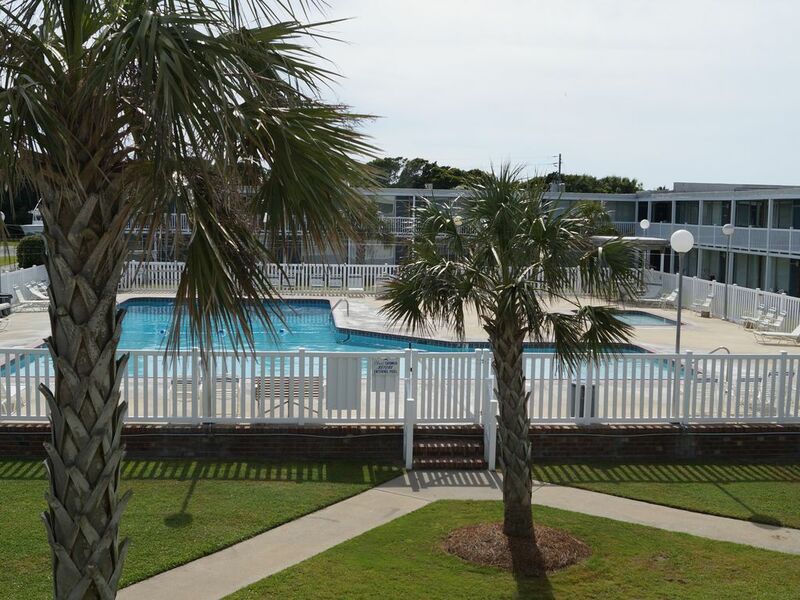 We also have a new, wall mounted flat screen tv with cable and the best features of all: the largest pool in Atlantic Beach offering shadded gazebos and a kiddie pool for the little ones.Enjoy a quick walk across the street directly to the beach. If none of these options suit you there is also lounging available down the walkway from the condo to overlook the sound with picnic tables and chairs. You will also have access to the onsite grills. Dining, movies, shopping and plenty of tourists attractions are only minutes away. Contact us today! We currently live in Greenville, NC. Our families moved from Northern Virginia to Greenville approximately 30 years ago. I have worked for East Carolina University for almost 15 years and my husband has worked at HD Supply for almost 20. We are ECU Pirate fans and enjoy living in Eastern North Carolina. My husbands family has had a place a the beach since the early 60's. They sold their beach home and purchased this condo. We acquired it from them not too long ago and completely renovated it hoping to attract visitors so they can come enjoy the beach and enjoy all it has to offer; shopping, deepsea fishing, swimming at the beach or relaxing at the pool. The biggest pool in Atlantic Beach along with a pool for the kiddie's. Great location! Nice Beach touches to the rental! I've stayed twice here and each time it is wonderful!! Very nice clean and everyone was friendly, even during their recovery efforts. Short walk to the beach, great back yard with grills on the sound side. Overall a great experience. Property was older but very clean and very comfortable. Great access to beach and sound. Very nice place to stay. I would stay again. Very nice place to stay. I would like to come back soon. We had an amazing time! Loved the room and can't wait until next time! Best pool on the coast! We've stayed at this condo before. Love that it's on the second floor (stairs are easy) and the studio size is perfect for us. Great to spend time on the sound side and across the street at the beach. The NC Aquarium is not far. It is located off of Salter Path Rd. It's been recently updated and a nice place to visit. Ft. Macon Park is a truly must see. The history alone is worth the trip.